The component overlay for the VER1.2 PCB. Click here for an enlarged, printable version. Print at 300dpi for a correct scale printout. There are numerous ways this board can be used. For example, each input could be fed by a pot wired as a voltage divider, with it's input end normalized to +VE via a 1k resistor. This way you would be able to use the module as a sequencer when not using it as a switch. It is also possible to wire in a "steps" switch. Each of the "T" pads is wired to a successive position on an 8 position rotary switch, with the switch common connected to 0 volts/GND. There are two suitable 0V/GND pads provided on the PCB. One step size input should be taken to a pot to allow for a fixed step size to be selected without additional CVs present. A 100k linear pot wired between +15 and -15 volts fed into one of the subtract inputs would be ideal. Note that the +15 should be connected to the counter-clockwise end of the pot. The range should be limited by connecting a resistor 470k between the wiper of the pot and the SS pad on the PCB, or by replacing the resistor on the PCB itself with a 560k resistor. A second pot could also be added as such, but with a larger value series resistor, so as to operate as a "fine tuning" control. Doing so would sacrifice the second subtractive input. Alternately, the series resistor could be taken directly to pin 6 of IC3. The remaining step size inputs can be taken to panel jacks either directly, or via attenuators. To wire up such an attenuator, use a 100k linear pot with its counter-clockwise end connected to 0V/GND, its clockwise end connected to the panel jack, and its wiper connected to the SS or SA pads on the PCB. There is a single input provided, marked IN. This can be taken to a panel jack either directly, or via an attenuator wired as described in the point above. Additional inputs can be wired to the pad marked M2, though these will need series resistors of 100k added. There are two identical offset inputs provided. They can be wired as per the main input, either directly to the panel, or via an attenuator, or connected to a pot. If connecting an initial offset pot, the associated input resistor on the PCB should be increased to 470k. There are two reference inputs provided, each labelled differently (Initial Step CV and Ref). They can be wired as per the input, either directly to the panel, or via an attenuator, or connected to a pot. If connecting an initial step size pot powered from the power rails, the associated input resistor on the PCB should be increased to 470k. It should be noted that the module will not function with a reference value of 0V. A negative reference will cause positive steps to be added to the output, an effect that can be useful. The initial step size pot can wired between the positive and negative rails, instead of just between positive and ground. 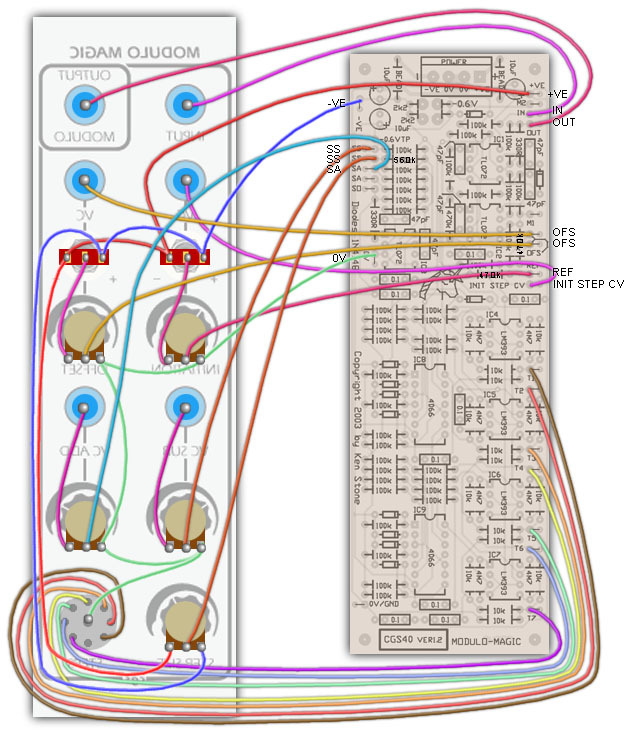 It should be possible to wire up a fixed modulo control, where the reference is fed the exact same voltage as the step size, though to do this would require the addition of a switch to isolate any other input to the reference input. A multi-turn trimpot would be required as the series resistor into the reference input to allow the correct scaling to be set. Note that changing the number of modulo points also changes the distance between the sensing points, so the fixed modulo switch would also need to disconnect the common of the rotary switch. A possible wiring solution, showing several options mentioned in the text above. The Pos/Neg switches were included as this will allow the manual controls to be easily set to zero by turning the pots fully counter-clockwise. This example is how Ken wired his Best of CGS panel. Some resistor values were changed as per the notes above. Yes, it's a very complex, even confusing, design. While untested, the module should work on +/-12 volts.